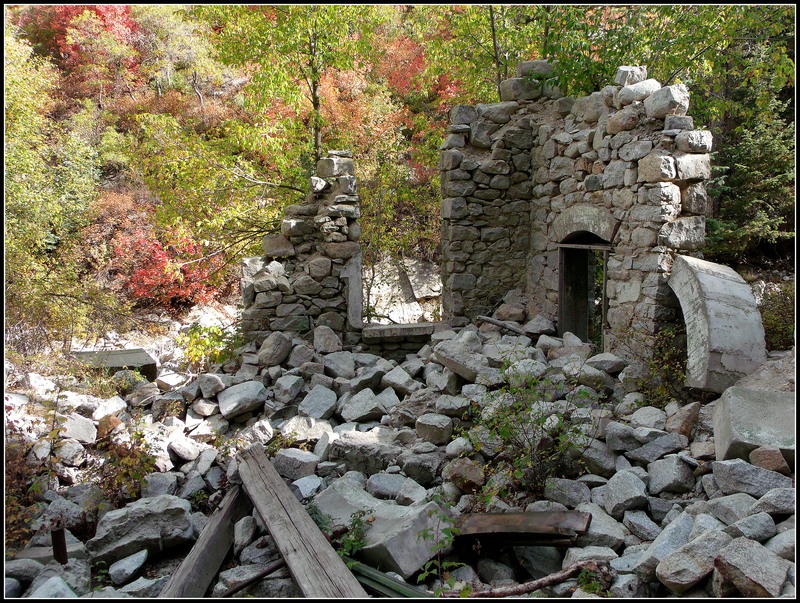 What are the ruins in Little Cottonwood Canyon, Utah? 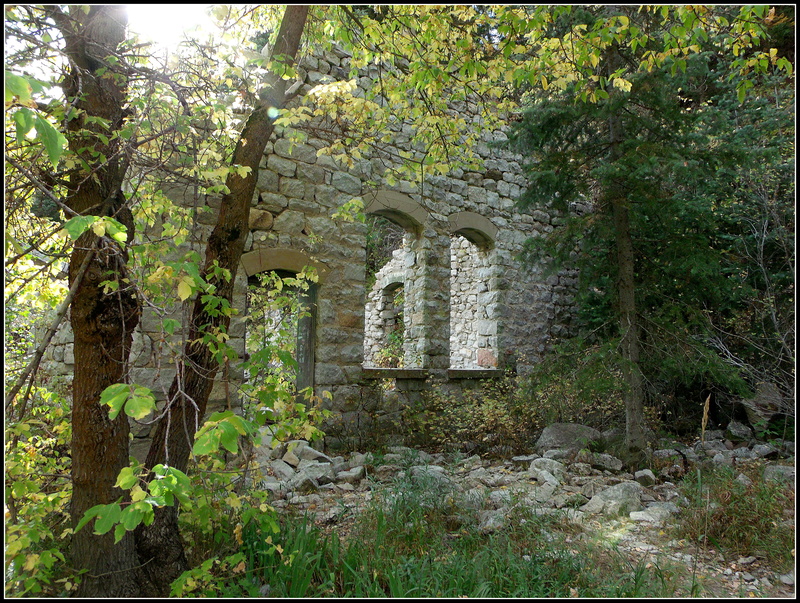 Those were the words that I typed into Google when I returned from my first hike to this end of the Little Cottonwood Canyon trail and found these ruins. 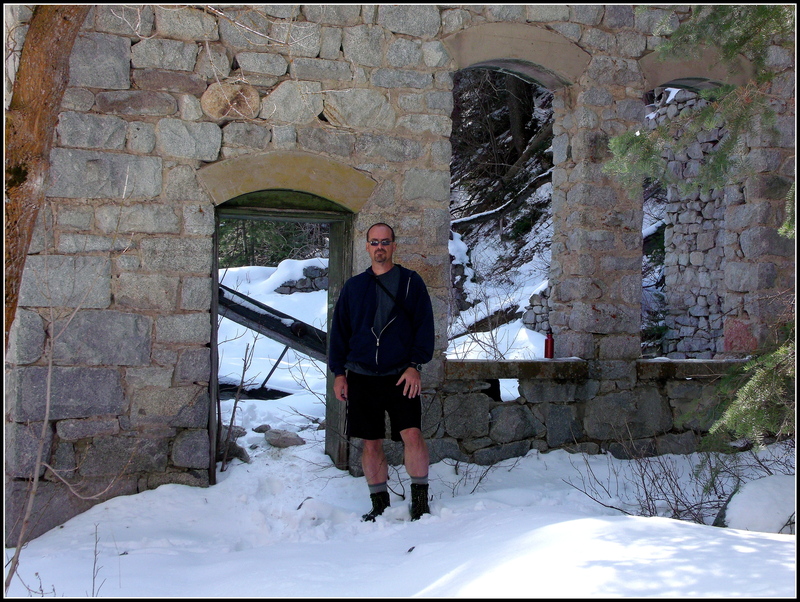 The below photo is from that first hike and sighting of the ruins…taken in November, 2010 (take note the arch over the window-frame on the far left end of the building). I found an “ok” article on Wikipedia that talked about skiing in the canyon…and some other generic information, but nothing that addressed the ruins specifically. I then went to “images” on Google and did find some images, similar to these, but nothing that provided links to historical information…only suggestions that it was a church, evidently thought to be one because of the nice arches above the tall window frames. I think I must have found a couple/few mentions of the building being a church in some Flickr albums…. I later wrote a little story about it having been one…which you can read by clicking on this highlighted name – Ruins. But it wasn’t a church…a beautiful building at one time, maybe/yes, full of mystery (explainable), and even charged with electricity (literally), but there wasn’t an altar or communion table, no preacher, priest, or prophet directing the administration of an almighty…the building was an electricity generating station…a power-plant made of white granite blocks that appear to have been hand-carved from boulders that had tumbled from the mountains above it…. 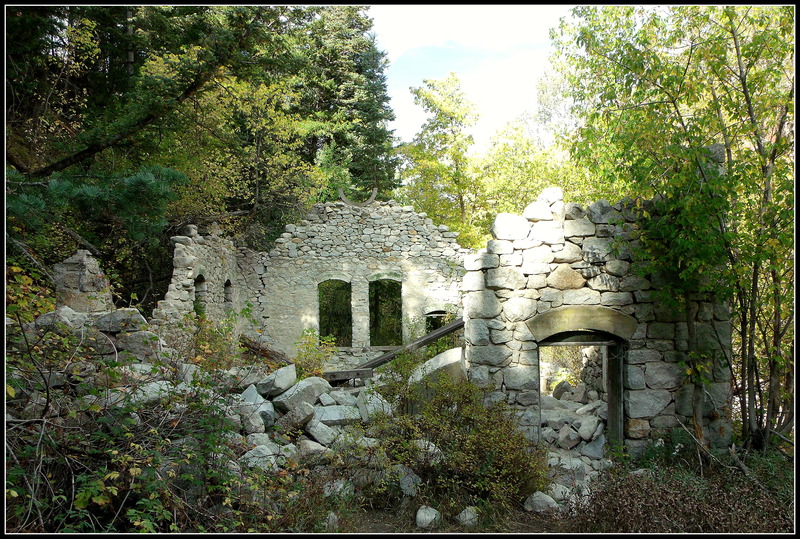 The Columbus Consolidated Mining Company started building the generating station in October of 1903 to power the mining operations at Alta, about four to five miles upstream near the end of the canyon. The availability of electric power would allow the company to use compressed-air drilling machines, motor-driven concentrating/smelting machines, and turbine pumps to remove the ever-seeping water from workers’ tunnels so that the mining operations could continue. Immediately to the left and out of the frame of the above photo, there used to be a bridge that crossed from the other side of the stream to the power station. The bridge was removed at some point, and until recently, hikers/adventurers could only cross the stream when the water level was sufficiently low enough to allow for rock-jumping…or wading. I say “recently” because someone has very recently installed a nice 2×6 single-board “bridge” with a miniature zip-line overhead to allow for careful crossing over one of the narrower parts of the stream. One of my sons and I managed to cross the stream this past April (see the last two photos) when the stream was very low before the snow-melt began. The inside of the ruin was still covered in deep snow and it was difficult to discern what it might have actually been…even though we had more than a little bit of confidence that it wasn’t a church because of the power poles and apparent water pipe/chute that we could see through the broken floor. The water pipe/chute that I mentioned above is actually located just out of frame and to the right in the above photo…it didn’t make a very interesting photo…so it’s still in its folder on my computer and not appearing here…maybe that’s a shortcoming of mine as its photographer…but it simply didn’t look very compelling…anyway…. During my explorations, I also found another three places where the underground pipe had been exposed, one on each far end of the building property, and the third on the opposite side and downstream from the ruin. 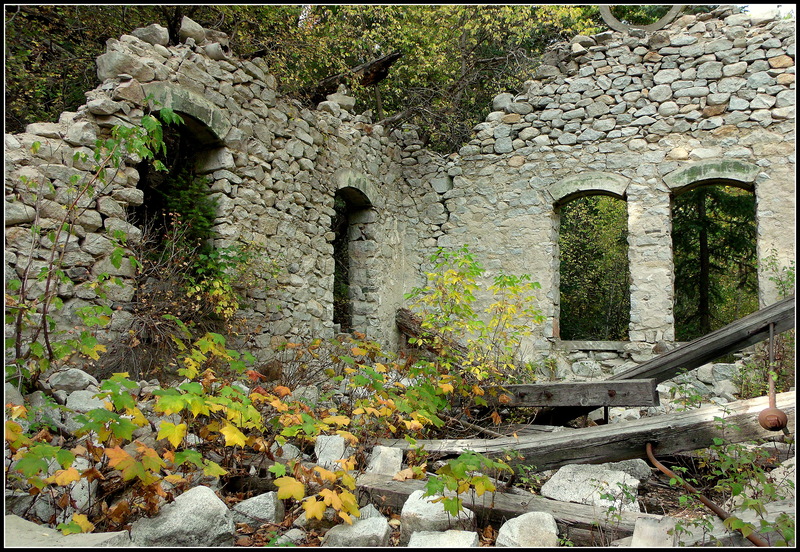 These autumn-toned images are from my first, non-snow-covered visit into the power station ruins. I had been on the trail earlier in the year and had looked into it from afar, waiting for the water level of the stream to go down again…yearning to sit there for a while so I could process what I had learned of the place and match it to what I could see in front of me…and to listen for echoes of distant voices, the quiet rushing of water beneath my feet…and the fleeting sounds of whirring motors. I provided all of that info above to simply say that there was a dam built on the stream at Tanners Flat. 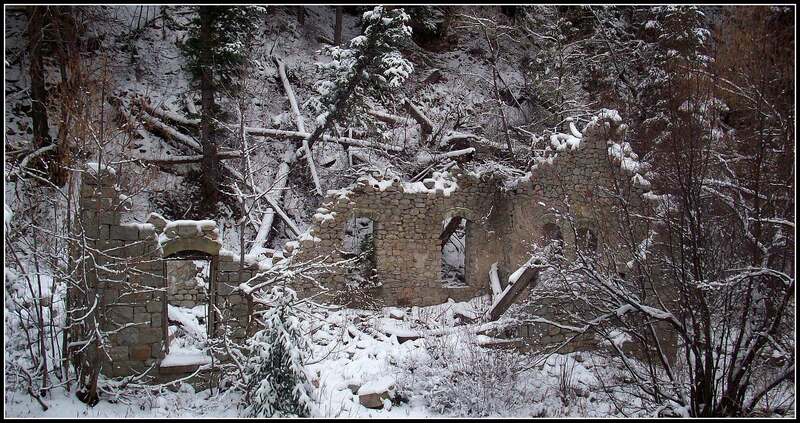 The water was diverted into 22-inch pipes that traveled about 4,500 feet downstream and was shot into the power station to turn the waterwheels, which, in turn, powered the generators that sent their electricity back upstream to the mines, boarding-houses, businesses, residences, etc., in the Alta area. I haven’t seen it yet, but I understand that there are also remains of the retaining wall of the breached dam…somewhere along the southwest corner of the campground…which probably won’t be too difficult to locate. 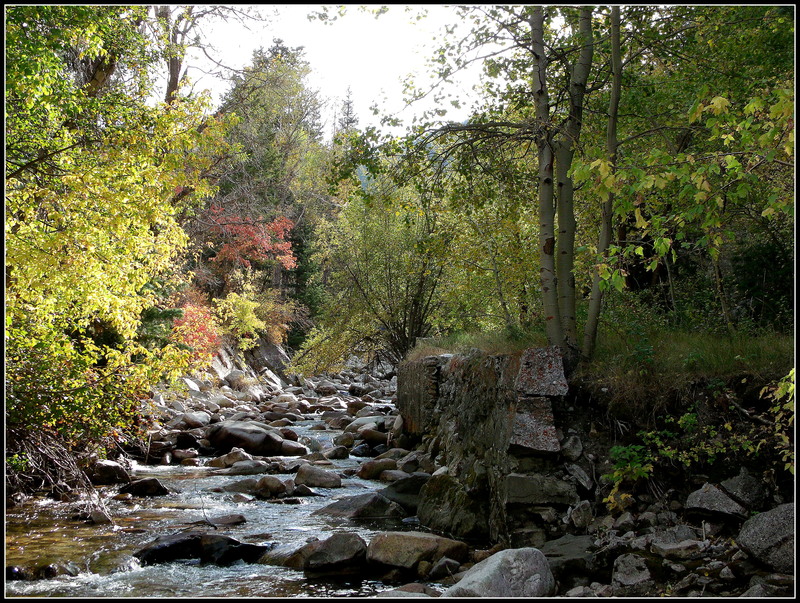 I don’t know that I’ve mentioned it elsewhere, but if you’re able to access a map that shows details of Little Cottonwood Canyon, the power station is located approximately halfway between Hogum Fork and Maybird Gulch…on the south side of the stream. You can see that the arch of the window-frame is missing in the above and below photos (as noted in the very first photograph above, taken in November, 2010)…and you can see that it is also missing in the next to last shot, which I took in November, 2011…so it was either removed or had fallen on its own during the intervening year. 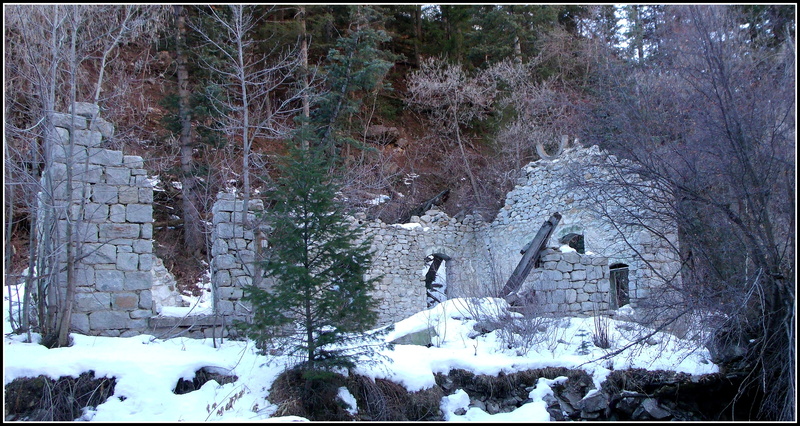 If you ever come across a copy of Charles L. Keller’s book, The Lady in the Ore Bucket, first printed in 2001, you can see the author’s photograph of the ruins (Figure 35) in which this wall, that is now missing its window arch, is largely intact from one end of the building to the other, from the ground to over the tops of the windows…and the east end of the building, which is the far right end in the above photo, is nearly as complete as the front wall is on the other end of the building. For clarification/orientation, the largest intact portion of the structure is the west end (the “front” with the complete doorway and two complete window frames). The building is essentially parallel to the stream, which runs from east to west, and lies on the southern side of the stream. I mentioned above that construction of the power station began in October, 1903. As with many other pursuits in life, there were delays in the completion of the project, but it was finally finished, and electricity was finally produced and sent up to Alta on the evening of July 4, 1904. Because of an increasing demand for power up in the mining district, a second generator was installed in late 1905. In 1913, the Columbus Consolidated power station was made a subsidiary of the Wasatch Power Company, which was then merged into the Utah Power and Light Company sometime in 1929. 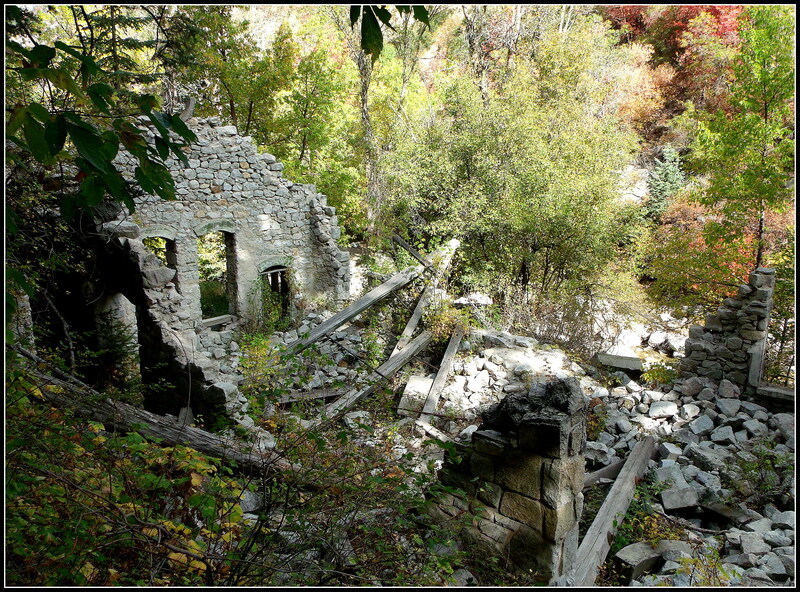 As the mining endeavors became less fruitful in the Alta area, and as electricity-producing technology advanced, there became less of a need for the plant here in Little Cottonwood Canyon. The precise date that the switch was turned off on the Columbus Consolidated power station has been lost to the passing of time, but it is believed to have occurred sometime in the early 1940s. Yes, that is a look of wonder on my son’s face in the above photo…can’t help but smile out there…. 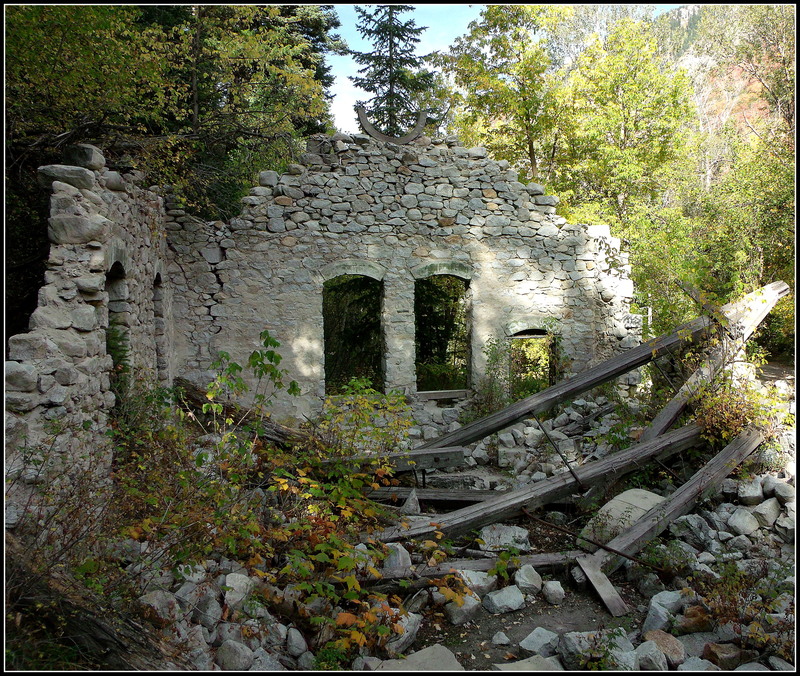 I hope you’ve enjoyed the trip back into the history of the Little Cottonwood Canyon ruins. If you’re ever in Salt Lake City, Utah, USA and want to take a relatively easy, six-mile hike (round-trip), find the Temple Quarry Nature Trail near the mouth of Little Cottonwood Canyon. The trail-head for the Little Cottonwood Canyon trail is at the far/east end of the quarry’s parking lot. Have a nice hike! ***Please note that all of the historical information provided above was obtained from Charles L. Keller’s book, The Lady in the Ore Bucket. I was introduced to the book by Knick Knickerbocker of the Wasatch Mountain Club. He shared the information about the book during a conversation that we had on a rainy Sunday afternoon while hiking down the Days Fork trail in Big Cottonwood Canyon. This entry was posted on October 4, 2012 by seekraz. 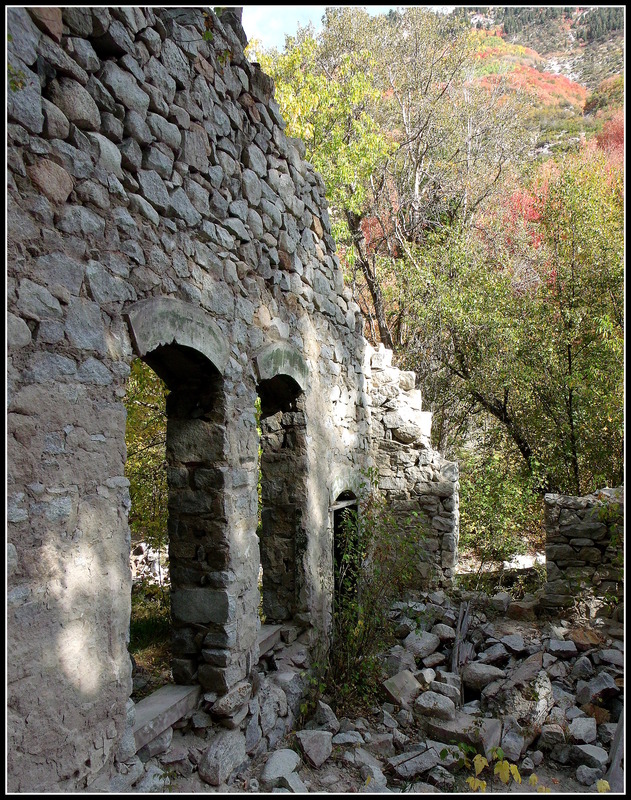 It was filed under Photos - Outdoors and was tagged with Charles L. Keller, Columbus Consolidated Mine, Columbus Consolidated Mining Company, Columbus Consolidated Power Plant, Columbus Consolidated Power Plant in Little Cottonwood Canyon Utah, hydroelectric history of Utah, hydroelectric plant ruins Salt Lake City Utah, Little Cottonwood Canyon Stream, Little Cottonwood Canyon Utah, photography, ruins, ruins in Little Cottonwood Canyon, Salt Lake City history, Salt Lake City Utah, The Lady in the Ore Bucket, Utah history, Utah mining history, Wasatch Mountains, Wasatch National Forest. Very nice read and photos. Do you find that knowing more about the ruins enhances or detracts from the wonder of exploring them? Or does it just take it to a different level? I ask because when I come across something, it’s full of opportunities, and lets me play with figuring out what was going on. Knowing changes things, although knowing for some can enhance the experience. In some instances, not. Thank you, Emilio…I appreciate your nice words. I think knowing more about the ruins actually enhances my wonder in exploring them. The first times I had seen them, I literally sat and pondered what they might be, like you, considering the possibilities. I studied the stream bank, noted what I thought was an exit or chute that is situated just beyond what we can see of the furthest point of the stream-wall in the second photo…examined the power poles from the other side of the stream, and considered a bit of wall/dam-works that I found downstream about 30 yards or so…and thought that it must have been some type of mill or power station. The notion of it being a church just didn’t mesh with the physical location…the middle of a canyon…no sign of obvious dwellings nearby (even though I allowed the possibility of it being such in the “story” that I wrote)…. And now, knowing what it was, I can imagine things specifically…can wonder at the workings of the place, the people who staffed it, and marvel at the obvious engineering efforts that went into building everything that it needed to generate electricity and send it back up the canyon. I enjoy knowing the history of the place. Really enjoyed it. It appears that many small details have been read through before writing this, for us readers. Thanks for sharing. I’m glad you enjoyed it, Pattu…and yes, I did go over the details a bit…repeatedly…in preparing this for you. 🙂 And you are most welcome, too…. It is a delight to read your posts, and get to know that part of the country, in detail. Fascinating history there Scott and some smashing photographs! Thanks for that, an enjoyable read. Thank you, Chillbrook…I’m glad you enjoyed the look back into time. It was my pleasure sharing what I could here. It’s great to finally get the full scoop on this. I do wonder, though, what that half moon is at the top of the building in picture 6. Any ideas? It is very interesting, Nate…and I’m not sure about the half-moon up there on the western/full wall, but I would guess that it is the remaining frame from a circular window…or maybe a vent…not sure…. Loved it! As always thank you so much for your dedication to your blog. Love seeing and learning about other parts of our country. Well researched, photographed and written. I can see why you thought it was a church at first glance. They went to quite a lot of trouble with details considering this was only there really to generate electricity. Thank you, Andy…the author of the book I mentioned above referred to the windows as “stately.” I think that’s a good word for them…and yes, quite a bit of trouble and effort for a nice presentation. I like the steps leading up to the area right outside of the door in the third photo…like stepping onto someone’s porch. I wonder what made it fall. Snow load / lack of maintenance maybe? Probably a combination of both, Allen. I don’t remember being able to see that the beams were down in the picture that is in the book mentioned above (that is probably over 10 years-old), but the way it’s laying now makes it appear to have caused some damage when it fell…but that’s only a guess. It was satisfying to find out about those ruins, wasn’t it. Interesting read and great photos! Seriously, though, I find the stonework that went into that building remarkable. Thank you, Gunta…it was very nice to learn that bit of history…good reading, actually…seeing the back-story, understanding the need for electricity up there, and then learning about the progression toward the end, even though the specifics on that are still unknown. I agree about the stonework…it was nice to be up close to it, instead of on the other side of the stream…being able to admire the craftsmanship and wonder about it all. So we have both been wandering through history this week! Very interesting reading! Fabulous images of the ruins Scott. Great angles. You really captured an essence. It was especially interesting how the tones and white balance lend to warmth and draw the viewer in in the summer images, and the images with snow have much colder tones – more blue and feel so much colder. Nicely done! What an interesting ruin to have found here. Thanks for the details too. That enhances the images, I think. I enjoy your telling us what you know about this fascinating canyon! It appears that its had quite a colorful history. I was imagining that as I looked at the pictures. Very nice post. I’m glad I happened to stumble across this post again tonight, George…I missed you visiting here, somehow…about six weeks ago. Thank you for digging back into the archives for this one. I’m glad you enjoyed visiting with me here, too…and it’s always a pleasure to share the info from my found treasures here in “my” mountains and canyons. Thank you, again, for being here, George…I do cherish your visits. Thank you very much for your research into this building! Living in New England, seeing the first picture I immediately thought ‘”mill”. Well, it sort of is. There are so many abandoned mill buildings throughout the landscape of New England. Sometimes walking way out in the woods we come across a spillway and a few huge granite foundation stones.All other signs of a previously alive and thriving village gone. Some places in the cities have huge blocks, full neighborhoods really, of empty mills/factories. The energy surrounding them draws me in. The incredible amounts of energy it took to build them –so carefully built with solid craftsmanship –and the energy of what went on in them. Such a treat that you took the time to find out the history of the “ruins” and post them with the photos. Thanks so much! (I know it was a while ago but just started following your blog which I found over at “the hour of soft light”.) Really enjoying your pictures and stories. Hello, Gabrielle….and it’s so nice to have you here…and nice to know, too, that you’ve been visiting with Liana over at Soft Light. She has some amazing photography…and wonderful words, too. I’m glad you enjoyed the photos from this post. I, too, love the history and wonder at what echoes must remain in the walls of places like this. I’d love to explore the mills and other abandoned buildings in your old New England towns…that would be fantastic. Great info. I was wondering about that myself lately. I found your blog through a Google search for Tanners Flat Campground. I drove through Little Cottonwood Canyon this evening and wondered if there was any hiking through Tanners Flat. Loved your narrative and photos. I would love to hike to those ruins! I love stuff like that! Are they accessible from the Temple Quarry Nature Trail? I’ve never hiked that one so not sure I would be able to find it. Any helpful hints/suggestions? Is it easy to find? Hello Tiffany – thank you for stopping-by the blog and leaving me a comment…letting me know that you were here. 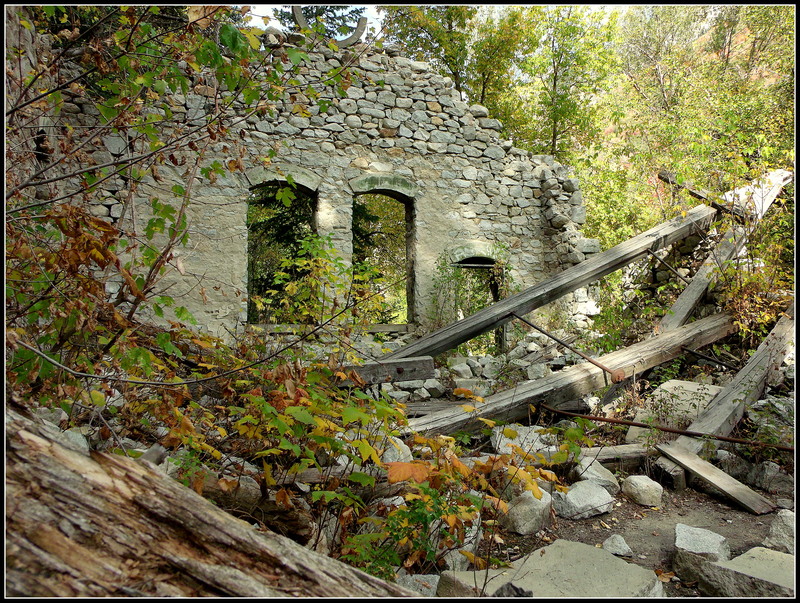 There are at least two “formal” access points to the trail that leads you to the ruins. You may start at the east end of the parking lot at the Temple Quarry nature trail. 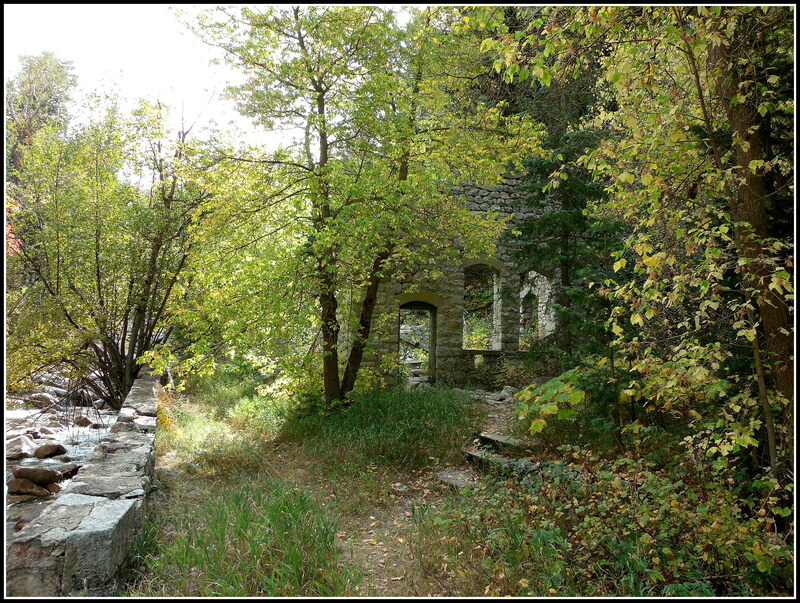 This will take you to the old Wasatch Resort, private property that is near the Little Cottonwood Water catchment/filtering facility. The trail continues past the water plant and continues for a total of about three miles, taking you right to the ruins. 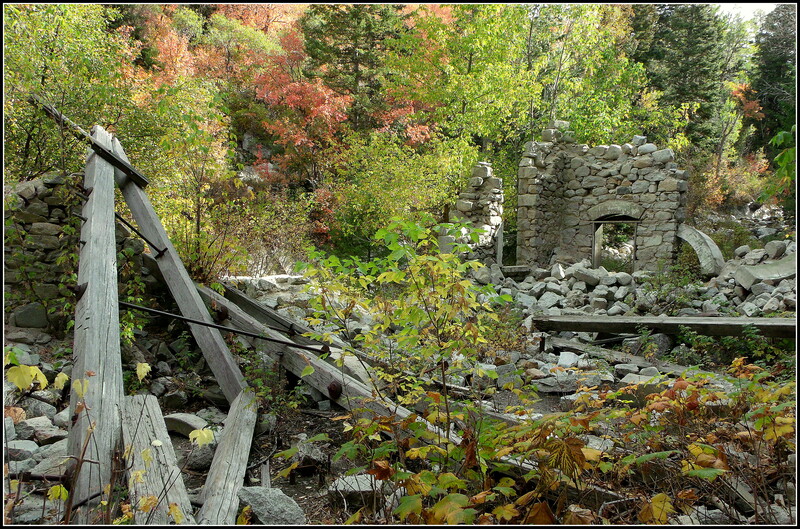 Another point where you can get onto the trail for a much shorter hike to the ruins is located on a couple of miles up into Little Cottonwood Canyon. You’ll pass another water catchment facility a couple of miles up into the canyon, shortly after that building, you’ll find another trail-head on your right-hand side going up the road. Follow this trail to a “T” in the trail, turn left, and then follow the trail for maybe a quarter to half a mile to the ruins. They’re on the far side of the stream, but there is a make-shift footbridge that someone has erected just down stream from where the old cement bridge was removed several years ago. Have fun hiking the trail…and watch-out for the mountain-bikers, they’re rather fond of it, as well. I sent you an email…. Finally hiked to the ruins this evening after asking you about it back in May. Thank you for the info, it was a gorgeous fall evening and I had the ruins all to myself. Very peaceful and magical. I’ll definitely be doing this one again at different times of the year. 1966 to 1973. I was there many times. Circular openings apex of East and West walls, for insulators, electric wires and supports for same. How sad my heart to see the disrespect of people. Please get historical society to repair and protect the site. Breath deep, the air there is healing. Hydrogen radicals from the crashing water that rolls the boulders on the creek bed. Hike across southern flats and halfway up southern slope find the biggest tree. Sit with your back against it and look up. Pray, I did. Hello, M K….I don’t know how I missed this…but thank you for visiting and leaving a comment so that I know you were here. I don’t know how many times I was there, but I found it beautiful and peaceful each and every time, whatever the season…and while I never prayed out there, I cherished the soul-healing quiet and communing with that little piece of eternity out there. Just found this place while hiking a few weeks ago. Thanks for taking the time to write about it. We were so curious about it. Beautiful photos! Beautiful photographs and an excellent read. 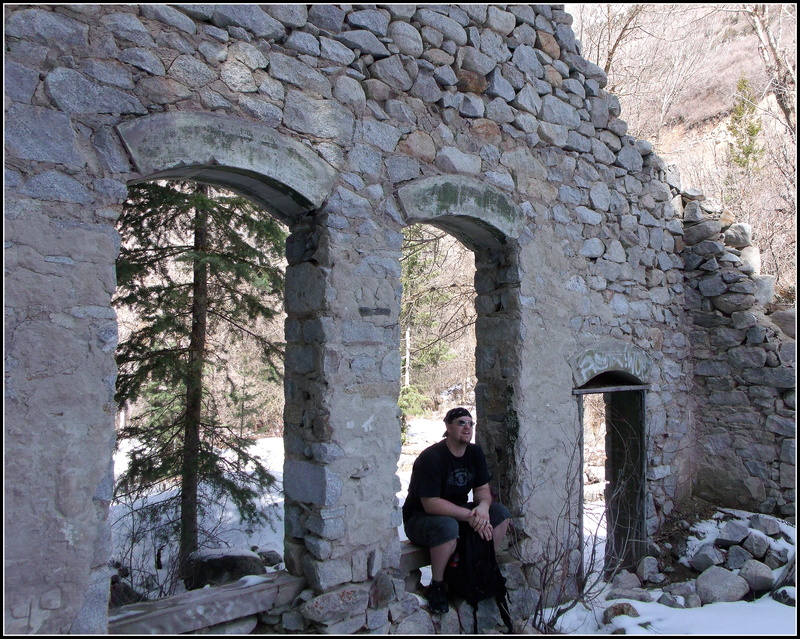 I love exploring old ruins, they all have a tale to tell. Back in the late 70s I met a gentleman oil painting about a mile down canyon from the power plant. He told me it was a power plant his dad ran and that he was born there. Also told me that there were steps carved into the bank to get mail from the train. Would be on the north side or highway side. I wonder if the painting gentleman had any photographs of the old power plant when it was still working, like from his childhood. That would have been a real treat, to have seen the captured images from that time. Thank you for visiting, John…and for sharing this bit of information that adds yet more to the history of the place. Thank you…. I have been around the temple quarry with my kids, but had never gone far up little cottonwood trail until this past weekend. This morning I went up further and hiked to this ruin, had never seen or heard about it before, and I was wondering what it was, thanks for the helpful research!